Pakistani-American Prof. Asim Khwaja and his doctoral student Bailey Klinger at Harvard’s Kennedy School of Government observed that banks have money to lend, but even profitable small businesses in developing nations often cannot access it, choking growth. The lab’s model asks questions that do not necessarily have a right answer; using an algorithm, it aims to predict whether an individual is likely to default based on how the answers relate to one another. For example, to assess their sense of personal control over outcomes — which tends to correlate with loan repayment — respondents might be asked to rate how much they agree or disagree with the statement: “I believe in the power of fate.” Another question on risk tolerance might ask them to choose between opposing responses with equal social desirability, such as: “I plan for every eventuality,” “I’m in between” or “Planning takes the fun out of life.” There are some unexpected findings: Optimism and self-confidence are good signs among seasoned entrepreneurs, but high levels in younger business owners do not bode well, statistically. And the math and reasoning questions meant to measure fluid intelligence can also assess integrity — of the loan officer. Too many correct answers can reveal that an applicant was coached. Banks in 16 developing countries are now using EFL's psychometric test to lend money to owners small and medium size businesses. Bank financing of small and medium enterprises (SMEs) is good for both the borrowers and the lenders as well as the national economy. It's a great source of revenue and income for the financial institutions. It helps small businesses grow and create jobs. In developed economies like the United States, SMEs create about half of all business activity and almost two-thirds of employment growth. In poor nations, such enterprises, on average, account for only about 17 percent of spending and one-third of new jobs. 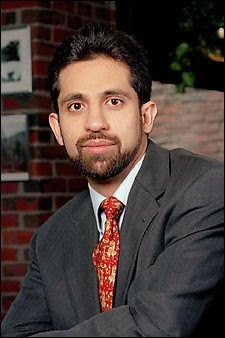 Asim Khwaja is Professor of Public Policy at the Harvard Kennedy School of Government. Here's his bio as posted on Harvard's Center For International Development website: "His areas of interest include economic development, finance, education, political economy, institutions, and contract theory/mechanism design. His research combines extensive fieldwork, rigorous empirical analysis, and microeconomic theory to answer questions that are motivated by and engage with policy. It has been published in the leading economics journals, such as the American Economic Review, and the Quarterly Journal of Economics, and has received coverage in numerous media outlets such as the Economist, NY Times, Washington Post, International Herald Tribune, Al-Jazeera, BBC, and CNN. His recent work ranges from understanding market failures in emerging financial markets to examining the private education market in low-income countries. He was selected as a Carnegie Scholar in 2009 to pursue research on how religious institutions impact individual beliefs. Khwaja received BS degrees in economics and in mathematics with computer science from MIT and a PhD in economics from Harvard. A Pakistani, UK, and US citizen, he was born in London, U.K., lived for eight years in Kano, Nigeria, the next eight in Lahore, Pakistan, and the last eighteen years in Cambridge, Massachusetts. He continues to enjoy interacting with people around the globe". State of Bank of Pakistan's policies have catapulted Pakistan to the top of the list for microfinance in Asia. Pakistan ranks first in Asia and third in the world in Economist Intelligence Unit's overall microfinance business environment rankings. Similar support for SME sector loans can help stimulate the national economy, grow tax base and create much needed jobs to lift more people out of poverty. Tools like the EFL's psychometric test can be deployed as part of this effort to grow the SME sector. The International Monetary Fund (IMF) has named a Pakistani-American as one of 25 young economists who are expected to be most influential in the decades to come. In its September edition of Finance and Development, a quarterly publication of the IMF, the Washington-based lender has named 39-year-old Atif Mian, professor of economics at Princeton University, among 25 economists under 45 “who are shaping the way we think about the global economy”. Mian recently co-authored a book titled House of Debt, which has received critical acclaim from academia, policymakers and the general public. Nobel laureate Paul Krugman, arguably the most influential economist alive, has called Mian a leading expert on the subject of debt. Commenting on the state of Pakistan’s economy, Mian said the foremost challenge it faces is boosting domestic productive capacity. “The low export numbers tell us that Pakistanis have trouble producing good quality products that they can then sell to the outside world (and themselves),” he told The Express Tribune. The most important factor for long-term growth, Mian says, is the development of ‘sound institutions’ that protect an individual’s personal, contractual and property rights. Explaining that the systematic erosion of space for tolerance, plurality and peaceful coexistence is Pakistan’s core problem, Mian says the ‘rule of just law’ has been replaced by religious extremism and violence. “It is this core issue that separates Pakistan from Bangladesh and India, and restricts Pakistan’s growth potential,” he noted. But why are militancy and extremism so dominant in Pakistan, as opposed to a country like Bangladesh that shares a common historical bond? To a large extent, the fault lies with the policies of successive Pakistani governments, starting from Zulfikar Ali Bhutto, Mian says. “Bhutto legitimised the entry of sectarian clerics in politics by accepting the deeply flawed principle that a person’s religious belief ought to determine the extent of his or her rights as a citizen,” he said, noting that the flawed logic paved the way for sectarian politics that Ziaul Haq exploited. In House of Debt, Mian has investigated the role of private debt – rather than the debt of the government and financial institutions – in precipitating the economic crisis of 2008. Mian and his co-author University of Chicago professor Amir Sufi argue in the book that severe economic downturns have typically been preceded by a sudden and excessive increase in household debt. Data from the US and European economies suggest that people in the lower half of the income distribution tend to have a disproportionately higher marginal propensity to spend. Mian concludes that a shock to the wealth of subprime borrowers, like crashing home prices, results in massive cuts in their household spending. This sends the economy into a tailspin and causes foreclosures, unemployment and reduced output – a perfect recipe for an economic disaster. Mian is one of the few public intellectuals who identify the current siege of the Pakistani state by religious extremists as a joint legacy of Bhutto and Zia. “Today’s unstable macro environment is a direct result of the Bhutto-Zia legacy, and it needs to be reversed if Pakistan is serious about growth. Doing so is not easy. But there is no other choice,” he said. Harvard Kennedy School has named Asim Ijaz Khwaja as the faculty director of the School’s Center for International Development (CID). Khwaja serves as the Sumitomo-Foundation for Advanced Studies on International Development Professor of International Finance and Development at the Kennedy School, and he will remain in that position. He will start his additional appointment as director of CID on July 1, 2019. Dean Elmendorf commented: “Ricardo Hausmann has led the Center for International Development with great vision and dedication for 14 years, creating an environment of innovation for faculty research and a strong development community for our students. Under Ricardo’s leadership, the center has grown immensely, and I am very grateful for his service. Moreover, Ricardo’s work around the world has shown that the combination of academic insight and practitioner’s experience can create significant positive impacts on public policy. I am delighted that we can honor Ricardo’s contributions by naming him the Rafik Hariri Professor of the Practice of International Political Economy.” That appointment also will be effective in July.